Kids of all ages in Genoa Township now have a new place to shoot some hoops. A new basketball court was dedicated last week at Center Green Park, which was a welcome addition to the popular venue. Jennifer Frank, who lives across the street from Center Green Park, said she loves the area with its wildflowers and playground, but there wasn’t much for her 11-year-old son Peyton Frank to do there. 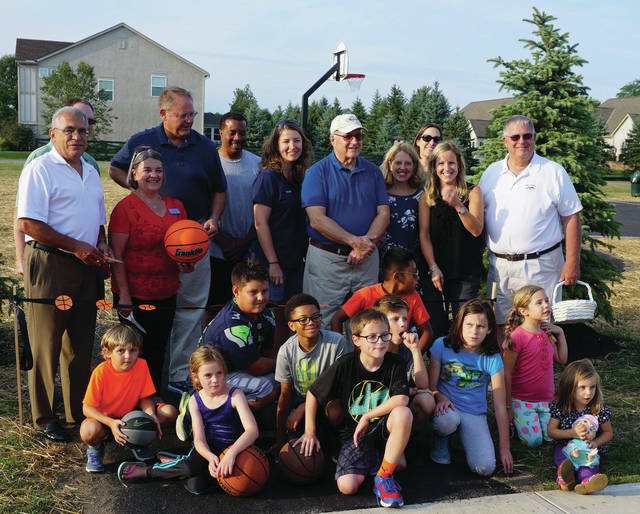 In February, she requested a basketball hoop from township officials, who told her donations would have to be collected to make the court happen. Friends and neighbors contributed funds. McCoy Paving, Inc. contributed materials and services. Township staff installed the hoops and benches alongside the court. “It’s been planned for years, but we didn’t have the funds to get it up, so we asked if there were contributions,” said trustee Karl Gebhardt at the ribbon cutting on Aug. 31. “It’s good to see the fifth grade and middle school students here now (using the court),” Frank said. Five neighborhoods share the park, which is well-patrolled by local authorities. Center Green Park is one of five developed parks operated by Genoa Township. Besides basketball courts, the 29.2-acre complex is home to trails, a playground (compliant with the Americans with Disabilities Act), a gazebo with outdoor grills and picnic tables, a fishing pond, and a sports field. The park is located at 7846 Center Green Drive in Westerville. Genoa Township also operates a community garden located at Worthington Road Park, 4539 Worthington Road. A network of trails in the township connects Genoa to the Ohio to Erie Trail, a 300-mile long system that links Cincinnati, Columbus, and Cleveland. For information about recreation opportunities in Genoa Township, visit www.genoatwp.com. Genoa Township officials and residents pose for the ribbon cutting of the Center Green Park basketball court. Local children participate in a free-throw shooting contest on the new basketball court at Center Green Park in Genoa Township.